Over 30,000 people have been protesting in Budapest over Hungary’s controversial new constitution, a day after it came into force. The country’s governing Fidesz party pushed the law through parliament in April after winning a two-thirds majority in parliamentary elections. Opposition say the new constitution threatens democracy by removing checks and balances set up in 1989 when Communism fell. The EU and U.S. had also asked for the law to be withdrawn. The dispute has cast doubt over talks on a new financing agreement with the EU and IMF, seen as vital for market confidence in the central European country. 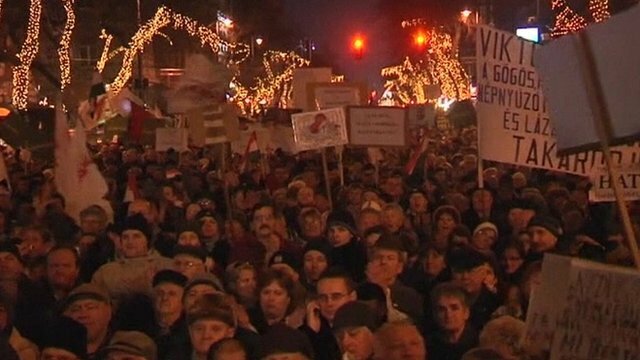 But the economic crisis facing Hungary overshadows both the government’s policies and the opposition protests. Fidesz party won the elections promising to create a million workplaces – but there has been no growth so far. As the public mood worsens, so do the country’s ratings, the chances of attracting foreign investment, and creating more jobs. Several centre-left opposition parties joined in the protests, held near a gala event organized by the government to celebrate the new constitution. Protesters chanted slogans denouncing the centre-right Prime Minister, Viktor Orban, and carried placards denouncing his “dictatorship” as officials arrived for the event. “Viktor Orban and his servants turned Hungary from a promising place to the darkest spot in Europe,” said Socialist MP Tibor Szanyi, quoted by AFP news agency. But Fidesz says the new constitution, or basic law, improves the legal framework of life in Hungary. “Despite political debates we think it is an important value that for the first time, a freely elected parliament created the Basic Law,” said Fidesz MP Gergely Gulyas, quoted by the Reuters news agency. Gergely Gulyas co-wrote the new law and shepherded it through parliament.